Q. What is the Bible? A. Besides being that wildly controversial best selling book of all time, the Bible is said to be the single most influential text in Western civilization. But while its influence is indisputable, its content has long been under hotter fire than refined silver. It is compiled of 66 books written by at least 40 different authors over about 1,600 years. One odd thing about it is that unlike other religious literature, it doesn’t just outline a belief system – it actually invites personal relationship with a Triune God. Another odd thing about it is that unlike other ancient literature, it doesn’t just record the political highs, boastful military victories, or perfect, deified kings – the good guys actually make a ton of mistakes and have problems (except for One peculiar character who ended up having the entire time line of history centered around His birth). Links found here will direct you to pages devoted to some of the most heated skeptic controversies in history – and on the web. Do your thoughts and writings have value? No matter what genre, in order for them to have any true value for the rest of mankind, they must present comprehensible thought of something or other in your mind or in the Earth that is based on a worldview that is established through fact. Do you know why you think the way you do, and if what you think is true? You should. If you haven’t quite decided, then allow me to explain why I think the way I do. I examine the world through the scope of the Bible, the worldview of which I base my understanding upon. The bestselling book of all time…the Book with more remarkable favor in the scope of world history than any other…has become the one Book the world wants no one to read. There has been so much misinformation about the Bible that I think atheists and Christians haven’t even been arguing over the same book! This article will be a presentation of the intellectual reasons for believing the Bible is the inerrant Word of God, and – as I once heard Jim Gardner say at a lecture – is “The History Book of The Universe”. THE BIBLE IS COMPILED OF 66 DIFFERENT BOOKS WRITTEN DOWN BY AT LEAST 40 DIFFERENT AUTHORS FROM VARIOUS BACKGROUNDS. THE BIBLE WAS COMPILED IN A TIME SPAN OF OVER 1,600 YEARS. THE BIBLE HAS NO MATERIAL ERRORS AND CONTAINS ONE COMMON THEME (REDEMPTION), AND ONE COMMON FOCUS (THE COMING OF A MESSIAH TO SAVE MANKIND). UNLIKE BOOKS FROM OTHER WORLD RELIGIONS, THE BIBLE IS ABOUT A RELATIONSHIP WITH A PERSONAL AND TRIUNE GOD (FATHER, SON, HOLY SPIRIT), NOT ABOUT A RELIGIOUS SYSTEM. The Bible is very different from other religious works. For instance, the Qur’an of Islam doesn’t have half as much a heritage. It was written by one man supposedly over a time span of 23 years. Through research, I’ve discovered that the Bible passes the three historical science tests that are required for a literary piece to be considered an accurate historical account. INTERNAL TEST – The Bible has no internal inconsistencies. EXTERNAL TEST – The Bible does not contradict known historical facts. BIBLIOGRAPHIC TEST – The Bible contains eyewitness accounts and second-hand reports based on eyewitness accounts. The accuracy between copies is also astounding. So, if we have ample evidence that the Bible is a credible historical account, we should take what it says seriously. It tells of stunning supernatural events, but do we have archaeological evidence that supports such things, or is it all just figurative nonsense fantasized by aging patriarchs? Let us examine one of the most famous Old Testament stories then: The Exodus. For years people were left with some vague idea that the Biblical Mt. Sinai was on the Sinai Peninsula in Egypt. The Egyptians encouraged the theory for tourism, but the mountain said to be the famous Mt. Horeb looked like just a plain, ordinary mountain. Such scanty evidence of anything extraordinary made the awesome story of the Exodus sound ridiculous. But surprise, surprise…a closer look at the Bible and other historical studies revealed that the real Mt. Sinai was actually in Saudi Arabia! The Bible does indeed refer to “Mt. 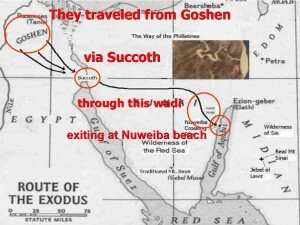 Sinai in Arabia”, and the verbal map in the book of Exodus blatantly points to Jebel-Aw Laws – Jebel Musa or “The Mountain of Moses”, as the Arab locals call it. Here is a power point presentation that someone made (apparently they were British, because some of the spellings are different from what I’m used to) that gives a masterful sneak-peek of one of the greatest archaeological discoveries in history. Click the image above to view the Red Sea crossing Power Point presentation. You can learn more about the archaeological discoveries at Mt. Sinai and Mt. Horeb by visiting www.splitrockresearch.org. What about the other strange claims the Bible makes? It claims to be the written Word of God. Is this possible? Could every page and letter of it really be God-breathed literature? I believe so, and because of this I examine everything in the world and in my life through the lens of the Biblical Worldview. Why do I believe the Bible is entirely the inerrant Word of God? The most stunning and revealing evidence of this are the prophecies that were written hundreds and thousands of years before they came to pass, and when they did come to pass, not a detail was left out! THE BIBLE PREDICTED THE FALL OF TYRE – Ezekiel 26:3, 21. THE BIBLE PREDICTED THE REIGN OF KING CYRUS – 175 years before Cyrus was born, a vivid prophecy about his life was written (including his name), Isaiah 44:28, Isaiah 45. THE BIBLE PREDICTED THE CRUCIFIXION AND RESURRECTION – The details of the Savior’s death were described and foreshadowed in Psalm 22, Psalm 34:20, Isaiah 53, Daniel 9:24-27, Zechariah 12:10, Exodus 12:46, Numbers 9:12. His resurrection was foretold in Psalm 16:10. THE BIBLE PREDICTED THE VIRGIN BIRTH – Some argue that the Bible is just a collection of musings by old patriarchs. Now what kind of patriarch would make up something as wildly unusual as the Virgin Birth? Not only does it sound too inconceivable (no pun intended) for the human mind to invent, but it was written as an identification sign of Jesus’ first coming in the Old Testament and repeated by angels to eyewitness observers in the New Testament. Isaiah 7:14, Luke 1:34-37, Matthew 1:23-25. THE BIBLE PREDICTED THAT JESUS WOULD BE BORN IN BETHLEHEM – In Micah 5:2, written over 700 years before His birth! This was confirmed in the New Testament by eyewitness observers – Matthew 2:1-6, Luke 2:4-6. THE BIBLE PREDICTED THE REIGN OF ALEXANDER THE GREAT – Daniel 11. THE BIBLE PREDICTED THE FALL OF JERUSALEM – Which happened in A.D. 70, was predicted by Jesus Himself decades before – Luke 21:20-24, which also gives a prophetic glimpse of what the Jewish people would suffer throughout history. Keep in mind that other ancient works contain “prophecy” that was written after the fact. For instance, the Roman poet Virgil (B.C. 70-19) wrote The Aeneid in order to convince the Roman people that his friend and their leader Caesar Augustus (B.C. 63 – A.D. 14) descended from a goddess and thus was chosen by fate to be the divine ruler (Note: As you can see, the “Divine Right of Kings” mentality originated with pagan rulers, not Christian). But the “prophecies” that were meant to be evidence of this were all crafted right then and there by one writer in one book attempting to cover a time frame with no regard to eyewitness accounts, which is the polar opposite of the way the Bible was written. THE BIBLE STATES THAT THE EARTH IS ROUND – Isaiah 40:22. THE BIBLE STATES THAT THE EARTH FLOATS IN SPACE – Back when most cultures thought the Earth being balanced on the backs of elephants and turtles and such, the book of Job (possibly the oldest book in the Bible) was way ahead of the game! – Job 26:7. THE BIBLE STATES THAT THE STARS ARE COUNTLESS – Genesis 1:24-25. THE BIBLE STATES THAT THERE ARE “PATHS” IN THE OCEANS – Before scuba diving and submarines were around, the Bible talked about it in Psalm 8:8. THE BIBLICAL COMMAND OF CIRCUMCISING MALE BABIES ON THE EIGHTH DAY IS MEDICALLY ACCURATE – The command in Genesis 17:12 has genuine medical implications, unlike the occult practices you would expect to find throughout primitive tribes. On the eighth day, male babies have the highest level of vitamin K (a blood clotting mechanism) than they will ever have in their lives, which makes surgery a safer operation. Circumcision is also known to help prevent the spread of sexually transmitted diseases. THE BIBLE STATES THE ATMOSPHERIC MODEL OF CIRCULATION – One semester when as I studied Physical Geography in college, I was impressed to subsequently discover on my own observation that the atmospheric model of circulation is accurately described in Ecclesiastes 1:6! Do you have any idea where the seven day week originated? The Bible provides the most comprehensive explanation. The first concept of a seven day week was invented in the book Genesis, which begins with the Creation of the universe. Different societies have actually attempted to shorten and expand the length of a week throughout history, but to no avail. The seven day week is the ideal chronological cycle for every day life, and has a documented beginning in the Bible that is set apart from any natural rationale. Some say that the seven day week originated with the Babylonians and that the Hebrews copied them. But this makes no sense historically. The Torah was likely written around 1400 B.C., a good 790 years before Israel’s captivity in Babylon. The use of the seven day week in societies around the world is evidence of the Biblical account of creation, because it offers an explanation for humanity’s inclination towards a schedule that has no humanly-deducted reason (i.e., mathematical or astronomical). It is fascinating that no matter how secular some one tries to be, they still end up honoring the God of the Bible through His design of the seven day week! Another Biblical thing that cultures share worldwide is acknowledgment of a global, cataclysmic flood. Perhaps all ancient cultures have a flood story, and most of them have these characteristics in common with the account in Genesis: the flood was 1) brought on by divine judgment, 2) global, and 3) eight people were saved in a vessel. Some cultures have slight variations, but the overwhelming presence of the story is evidence that a worldwide flood occurred at some point in human history. The Bible refers to the Deluge with different wording than it uses for typical floods – it’s called the kataclysmos in the New Testament and is said to have covered mountains and destroyed all life outside of the Ark. This event involved water shooting up from beneath the earth as well as unprecedented rainfall (Genesis 7:11), which indicates that it would not leave behind the remains of a typical flood. The geologic and climatic upheaval would predict rapid, chaotic fossilization and a subsequent ice age. HOW DO WE KNOW THAT THE BIBLE WE HAVE TODAY IS UNCHANGED? The Bible consists of 66 Books that were preserved and handed down ever since they were written, never chosen and eliminated by any council of man. What about the Council of Nicaea, you say? The only way to find out what happened in that oft-scandalized Council is to take a look at the primary source documents. According to Rufinus and Eusebius Pamphilius, the original intention of the Council was to bring to trial the heretical teachings of Arius, who claimed that Jesus was not one with God. This led to an examination of the Scriptures and the writing of the Nicene Creed. Martin Luther wrote that according to the Historia Tripartita, the Nicaea faith was grounded in the writings of the Apostles. Regardless of what all of the Church representatives “decided” about the Biblical canon, nothing about the Scriptures was really changed. In 1949, a remarkable discovery confirmed that the books included in the Bible had been preserved without error. The Dead Sea Scrolls were Biblical copies made thousands of years ago, but the writings contained were just the same as the contemporary Bible. Various scholars have claimed that some modern translations of the Bible (such as the NIV) have some wording errors that could be a hindrance to the reader’s understanding of God’s Word. In our household, we have an entire book case in our living room that is dubbed “The Bible Shelf” where we keep a concordance and several different Bible translations for comparison and study, including copies in the original Hebrew and Greek. I am studying Hebrew (and hope to study other “ancient” languages) so that I will be able to better understand the Bible for myself without the possibility of translations getting in the way. This is only an abbreviated primer of the uniqueness of the Bible. If you have any other questions or thoughts arise in your mind about the Bible, let me know and perhaps I can expand on specific issues pertaining to it. What great minds thought about the Bible.